Cibona stays in the fight to make it to the Top 16 in tough Group B by downing visiting Olympiacos 74-62 in Zagreb, Croatia on Thursday. Cibona improved to 3-3 in the Group C standings and registered its third home win of the season in as many games. Meanwhile, Olympiacos dropped to 2-4 and is 0-3 on the road this season. Damir Markota led the winners with 13 points. Damir Rancic, Scoonie Penn and Bennett Davison each had 12 while Davor Kus added 10 for Cibona. Andrija Zizic had 15 points for Olympiacos against his old team, while Sofoklis Schortsianitis had 11. Manolis Papamakarios and Zizic shined early, leading Olympiacos to a 16-22 margin after 10 minutes. The Reds' balanced offense allowed the guests to keep a 30-35 lead at halftime. Everything changed after the break, as Davison, Penn and an outstanding Markota pushed Cibona ahed 54-49 lead after 30 minutes. Rancic nailed 2 triples early in the fourth quarter, igniting a 13-2 run which broke the game for good. Zizic, in his return to Zagreb, started the game with a free throw for Olympiacos, while Manolis Papamakarios nailed a three-pointer and a layup to give the guests a 0-6 lead. Cibona needed more than 2 minutes to score until Penn nailed a jumper. Quincy Lewis matched that for Olympiacos, however, then Papamakarios nailed another triple to boost lead to 4-11 after 4 minutes. Penn added free throws for Cibona but Lewis answered from downtown for a 6-14 margin. Rancic fired a corner three for the hosts, but Olympiacos remained in charge. Christos Harrisis scored off a steal and Nikos Barlos added his own fastbreak layup to force a Cibona timeout at 9-18. After that, Rancic hit a new a three, igniting a 7-2 Cibona run that Penn capped with a driving layup to trim the difference to 16-22 after 10 minutes. Schortsianitis started the second quarter with a two-handed dunk and a put-back layup to boost the Olympiacos lead into double digits, 16-26. Another timeout was needed to get Cibona back on track. Markota woke the crowd up with a fastbreak dunk but Barlos answered with a corner three to give the Reds their biggest lead so far, 18-29. Rozic tried to rescue Cibona with back-to-back floating layups, as the hosts finally improved their frontcourt defense. A close basket by Mate Skelin and a free throw by Bennett Davison brought Cibona as close as 25-33. Tyus Edney slashed for a tough layup but Markora beat the shot clock with a close basket and Marino Bazdaric fired in a corner three to bring Cibona within 30-35 at halftime. Edney took over with a tough reverse layup early in the third, but Markota quickly answered from three-point range and Davison added a basket in the paint to bring Cibona with 35-37. Olympiacos had troubles in offense now, while Markota tied the game with a jump hook, while Penn put Cibona in charge, 39-38, with a mid-range jumper. 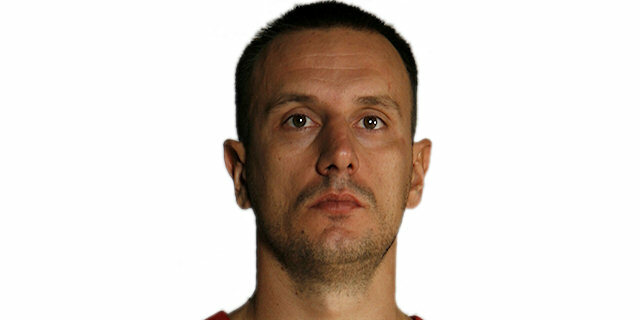 Schortsianitis kept the Reds alive with a layup which Edney followed with a floating layup, but Cibona was now on fire. Bennett stepped up with a put-back dunk and Markota added an outstanding power layup to give the hosts a 45-40 margin, after a 20-5 run. The guests switched to zone defense, while Panos Vasilopoulos woke Olympiacos up with a triple and Schortsianitis dunked it for a 47-45 deficit. It didn't last long, as Markota and Davison combined for 5 quick points and Penn made a short jumper to keep Cibona in charge, 54-49, after 30 minutes. Cibona found a go-to guy in Rancic, as he nailed back-to-back threes in the opening minute of the fourth quarter to make it an 11-point game, 60-49. Olympiacos quickly called timeout and adjusted its defense, but its shooters were off-target. Meanwhile, Kus made a fast break layup and Skelin scored inside to give Cibona a new biggest margin, 64-51, with under 7 minutes to go. Cibona dominated with an effective zone defense, while Kus capped a 13-2 run which sealed the outcome, 67-51, midway through the final period. The outcome was clear, as even when Olympiacos tried full-court pressure, Cibona still kept a safe 69-57 margin with under 2 minutes to go. Free throws by Penn and a three by Kus sealed Cibona's win in style. "This was a very important game, for the team and for me personally, my first Euroleague game this season. In the second half, we made our composition, played tough in defense and with lot of fastbreaks. That is the game we have to play to win. I had enough minutes, I am not prepared for more. But, while Cibona wins games, I don't care how I play."